Dominick P. DePaola, D.D.S., Ph.D.
Dominick P. DePaola, D.D.S., Ph.D., an associate academic dean at Nova Southeastern University’s College of Dental Medicine passed away in April. He was 70. Born in Brooklyn, N.Y., DePaola received a B.S. degree from St. Francis College in 1964 and a D.D.S. degree from New York University in 1969. Following dental school, DePaola completed a general dentistry internship at Beth Abraham Hospital in New York City. Subsequently, DePaola earned a Ph.D. in Nutritional Biochemistry and Metabolism at the Massachusetts Institute of Technology. In 1983, DePaola was appointed Dean of the Dental School at the University of Texas Health Science Center at San Antonio, a position he held until 1988 when he was appointed Dean of the New Jersey Dental School at the University of Medicine and Dentistry of New Jersey. During his tenure in San Antonio, DePaola also served as the Acting Dean of the Graduate School of Biomedical Sciences. DePaola held the position of President and Dean of the Baylor College of Dentistry in Dallas, Texas from August, 1990 to December, 1997 at which time the College merged with The Texas A&M University System. DePaola was Past President of The Texas A&M University System Baylor College of Dentistry. He recently retired from the position of President and CEO of The Forsyth Institute in Boston, Massachusetts, a post he held for 10 years. He was named President Emeritus of Forsyth by the Board of Trustees. Currently, DePaola was Professor of Oral Health Policy and Epidemiology at the Harvard School of Dental Medicine in Boston and Professor and Associate Academic Dean at NSU’s College of Dental Medicine. DePaola’s research on nutrition as it relates to oral health and disease was funded by federal, foundation and private sector sources. He was widely regarded as an expert on nutrition as it relates to health promotion/disease prevention activities and to oral disease, diagnosis, etiology and therapy. He published over 80 scholarly articles, chapters in textbooks, and contributed to editing two texts. Additionally, DePaola presented over 1,000 invited national and international lectures, seminars and special education courses at universities, foundations, private corporations, professional organizations, and governmental agencies, including the National Institutes of Health. DePaola’s research was funded by the NIH, Foundation, the private sector and state agencies. 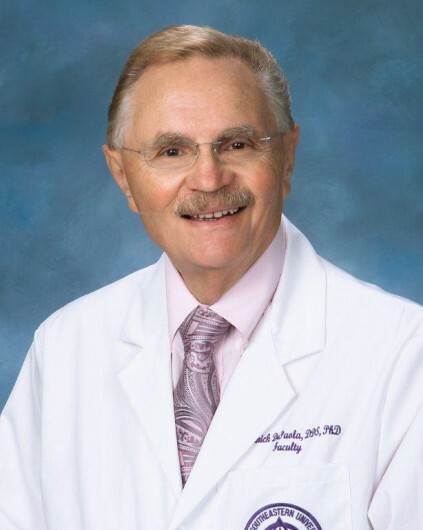 Among his numerous awards are an honorary Doctor of Science from the Massachusetts College of Pharmacy and Health Sciences (Honorus Causa), an honorary Doctor of Science from Baylor University (Honorus Causa) and honorary Fellowships in the American Academy of Oral Medicine and the Hispanic Dental Association. DePaola was selected as the 1995 Percy T. Phillips Visiting Professor by Columbia University and the Dental Society of the State of New York. In 1997, the U.S. Secretary of Health and Human Services appointed DePaola to serve on the National Advisory Dental Research Council of the National Institutes of Health. In 1990, DePaola was elected by his peers as President of the American Dental Education Association (ADEA). In February 2001, DePaola was awarded an Honorary Membership to the American Dietetic Association (ADA), the only dentist ever honored. He was elected President of the American Association of Dental Research (AADR) in 2003 and was the first person to have served as the President of both the ADEA and the AADR.